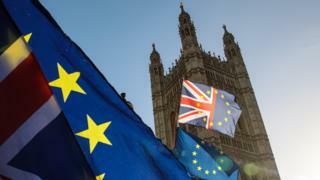 Trouble is, voters themselves – including not least those who voted Leave – have become deeply critical of how the UK government has handled Brexit negotiations; as data from research organisations NatCen Social Research and What UK Thinks suggests. As many as 66% of Leave supporters now believe that the UK is faced with a bad deal – even more than the 64% of Remain voters who express that view. It seems that the prime minister’s deal has failed to satisfy many of the very voters whose wishes the deal is intended to fulfil. Do UK voters still want to leave the EU? But does this negative reaction to the deal mean voters have changed their minds about leaving the EU in the first place? In truth, the polls have for some time been indicating that slightly more people now say they would vote Remain than Leave in another ballot. At present, the average level of support for the two options (after Don’t Knows are excluded) is Remain 54%, Leave 46%. In part, this is because Leave voters are a little less likely to say they would vote the same way again (82%), than Remain voters are (86%). But the swing to Remain, such as it is, is also down to those who did not vote in 2016. Of this group, 43% say they would vote Remain, whereas 19% say they would back Leave. In truth, the polls are too close for opponents of Brexit to assume that a second ballot would produce a different result. But, equally, supporters of Brexit cannot say with confidence that the balance of opinion remains as it was in June 2016. Do people support another referendum? So, do the UK’s voters want another referendum? That depends on how they are asked. Some polls introduce the idea of another ballot as a “people’s vote”, or a “public vote” and do not make it clear that remaining in the EU would be an option. When put to the public in this way, the polls suggest on average that supporters of a second referendum outnumber opponents by 12 points. However, the average level of support and opposition changes when people are asked if there should be another referendum with Remain as an option on the ballot paper. Asked in this way, opponents outnumber supporters by 11 points. But perhaps what is more important is that Remain voters are much keener on this idea than Leave supporters. That suggests the proposal is not yet a way out of the Brexit impasse that is backed by both sides in the Brexit debate. Remain and Leave voters may agree that they do not like Mrs May’s deal, but that does not mean that they agree on what should happen instead. Sir John Curtice is professor of politics at Strathclyde University, senior fellow at NatCen Social Research and The UK in a Changing Europe. He is also chief commentator at WhatUKthinks.org.